Last week we concluded the book of Genesis and this week we have begun the book of Exodus. Up to this point we have been studying a brief history of the world leading up to the emergence of the Children of Israel. Beginning in the book of Exodus, however, we now begin to learn about how God calls Israel out from among the other nations of the earth to be a bride to himself. From here we will learn about the marriage covenant between God and Israel, and their unique responsibilities in that covenantal relationship. Now, however, we are learning about how God raised up a single man who would be faithful over the flock of Israel and lead them in the paths of righteousness. This man, of course, was Moses. The English Standard translation says that Moses “looked this way and that, and seeing no one” he took action. However, the Hebrew is a little more visual. It says ki ein ish—because there was no man—he struck down the Egyptian. We can read this two ways. The first way is to say that because no one was watching him, he killed the Egyptian. This seems to be the plain and simple meaning of the text. However, we can also read it to say that because there was not another man available to defend the Hebrew slave, Moses rose to the occasion. If we think about this incident in these terms, it will help us understand the words of Hillel the Elder. Hillel taught his disciples, “In a place where there are no men strive to be a man” (Avot 2:6). Maybe he had in mind the actions of Moses in this incident? Because there was not another man to do what needed to be done, Moses had to become “a man” who would defend his brother. Leviticus 19:16 literally says, “You shall not stand against the blood of your neighbor.” However, it has always been interpreted to mean that we are obligated to defend those who are not capable to defend themselves. This is exactly what Moses did, and most likely an aspect of what Hillel intended in his statement. We are to “be a man” when there are no others willing to be one. Recently, there was a terrorist in Israel running around stabbing people at random. An Israeli man saw him and took off after him. After a long chase, he was finally able to subdue the terrorist and bring him to justice, but not without receiving knife wounds himself. In an interview after the event he described how he did not feel that he was a hero, nor were his actions optional. He said that the Torah did not allow him to stand by idly while the blood of his brothers and sisters was being shed. 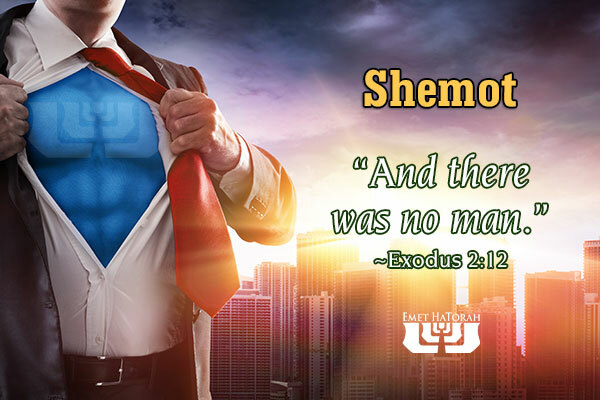 Because of the values he learned in the Torah he became “a man” who saved the lives of others and brought a heinous reprobate to justice. Most of us will never be in a situation like this where we are responsible for the lives of others. However, all of us are put into situations routinely that give us an opportunity to forsake complacency and become a man. As the popular expression goes, “Evil triumphs when good men do nothing.” If you look to your left and to your right and don’t see a man, then your time has come. Be a man rather than merely looking for one. Please consider contributing to help support this ministry via a financial gift.